Blondie and Brownie: Summer. Officially Over. 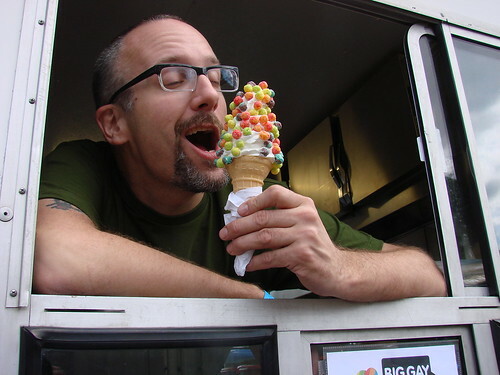 Today marks the last day of the Big Gay Ice Cream Truck's season! I stopped by last night to say hello, see what the plan for today is, and have an Affogayto Mexicano. The plan for the day is to stay at their regular 17th Street and Broadway spot until 6pm. Then it's time to mosey on over to Destination Bar, Avenue A at 13th Street for boozy fun times. They informed me that they plan on having as much of their menu as possible, including Choinkwiches, Gobblers, Salty Pimps, Dulce de Leche, maybe even some Curry Coconut or Grape Nuts, and hopefully most definitely, Affogayto Mexicano-"Mexican-style hot chocolate over vanilla soft-serve with whipped cream & Scharffen Berger cocoa powder & cayenne pepper." 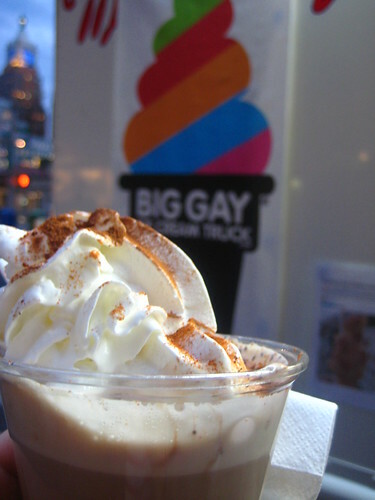 Of course, check their website, www.biggayicecreamtruck.com, and/or their Twitter before heading out the door, just in case! The recession is over, too!